1. Clean the bitter gourds well and dice them evenly. (Remove the white pith and the seeds before chopping). 2. 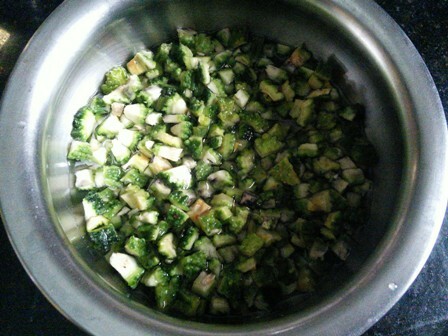 Put the diced bitter gourd in a bowl and add some water with a little lemon juice or tamarind juice. After 30 minutes, drain the water completely and wash it again.Take a vessel and add the chopped bitter gourds and 1/2 cup of water. Cook on low flame till its done. 3. In the meantime, do the chopping work and the grinding work. Chop the onions finely and grind the coconut paste with little water. 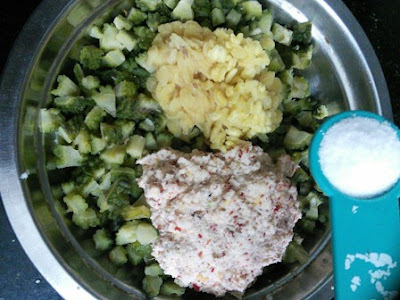 Add this mixture to the cooked bitter gourds. Add the require salt. 4. 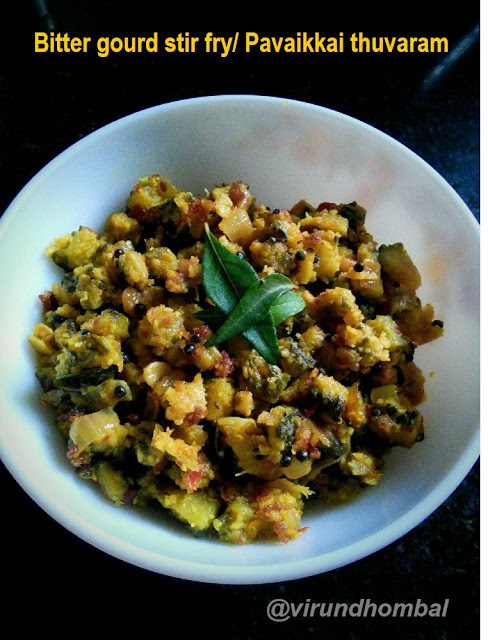 Heat 2 tbsp coconut oil in a pan or kadai. 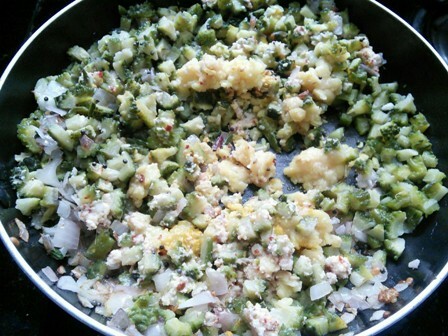 Add the mustard seeds and urid dal. 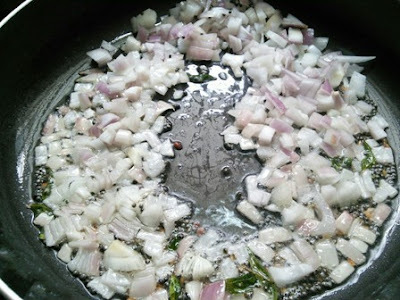 Allow them to crackle and add the chopped onions and curry leaves. 5. Stir and saute on a low flame for 5 minutes and add the mixed bitter gourds to it. Add 1/4 tsp turmeric powder and stir it. 6. Mix them evenly and let them to brown evenly. 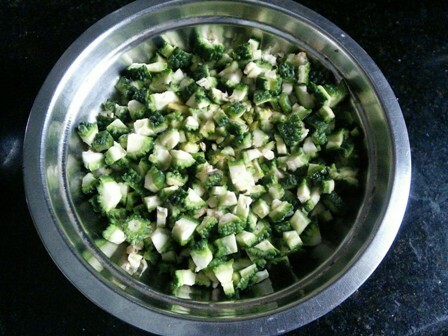 Stir it frequently to avoid burning in the pan or kadai. When it starts to brown, add the sugar. (This step is optional). 10. Switch off the flame when there is no moisture and the bitter gourds turn brownish black. 1. After chopping the bitter gourds soak them in water with a little lime juice or tamarind juice. After 30 minutes, wash the bitter gourds once again and cook them. (This method helps to reduce the bitterness a little bit). 2. Feel free to add an equal amount of chopped small onions or onions for this thuvaram. 3. Keep on low flame and stir it frequently. 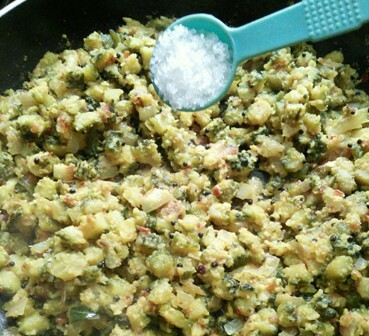 Do not switch off immediately after adding the bitter gourd mixture. The bitter gourd must be fried well in the oil. If you try this recipe for Bitter gourd thuvaram/Stir fry send us your comments below and share the recipe for your friends and family.